Nicola Sturgeon’s tax plans have been branded “all over the place” and in “disarray” after she admitted she believes in a 50p top rate of income tax, but will not introduce one. Ms Sturgeon has said she is in favour of increasing the levy on those earning £150,000 a year or more, but has ruled out such a move for the first year that ministers at Holyrood have control over the rate. As the election campaign entered its second day, Scottish Labour leader Kezia Dugdale claimed the SNP were in “disarray” in the wake of Ms Sturgeon’s comments, while the Scottish Conservatives’ Ruth Davidson warned against a “fresh tax grab” in Scotland. Ms Sturgeon meanwhile pledged to double free childcare to 30 hours a week during a visit to the SNP-target constituency of Dunfermline. But Ms Dugdale said restoring a 50p top-rate of tax – which Ms Sturgeon claims could lead to tax avoidance – would allow massive investment in education. She said: “Last year Nicola Sturgeon promised a ‘progressive alliance’, but this year she won’t ask the richest 1% to pay a penny more in tax. Scottish Liberal Democrat leader Willie Rennie agreed that Ms Sturgeon was “all over the place” on taxation and accused her of “gambling” with Scottish education. 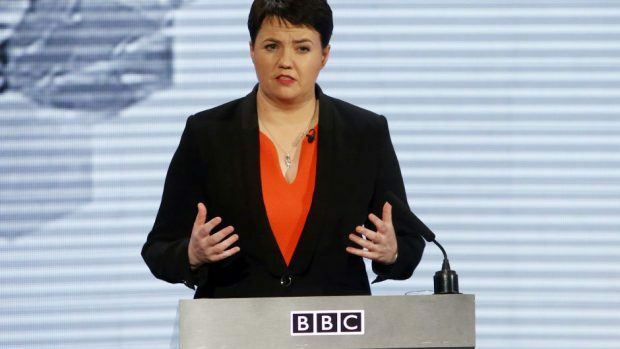 Ms Davidson said Scotland needed to be “dragged back to the centre ground” amid the arguments on taxation, which dominated the leaders’ first televised debate of the campaign. At a campaign meeting in Edinburgh, she said: “It’s clear that Nicola Sturgeon is putting politics before jobs, by now threatening a fresh tax grab in Scotland. “She succeeded only in adding more uncertainty – which isn’t good for jobs and isn’t good for Scotland.